Although it isn’t reflected in our name, Sitka Log Homes, also builds uniquely crafted timber frame homes as well as log homes. Where we are located in British Columbia we are very fortunate to have local access to some of the highest quality timber in the world. Our indigenous timber is forest salvage or sustainably harvested to ensure environmental responsibility. 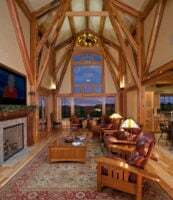 Our custom built timber frame structures combine elegance with an old world rustic appeal. Historically, timbers were hewn square using a felling axe and then surface-finished with a broadaxe; a lengthy and labour intensive process. We are able to imitate the rough textured timbers of the old-world craft by using new world precision and efficiency. 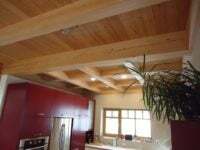 Timber framing offers the same flexibility as a traditional home but with unique and inventive open floor plan designs. These distinctive timber frame homes are often designed to reflect exterior natural settings by using warm and aromatic timbers within. We have the capacity for handling large projects and our craftsmen are highly trained with specialized equipment for oversize and oddly shaped timbers. Consider a timber frame home built by Sitka Log Homes for a unique centuries-old feel with all of today’s expectations of quality and modern comfort.